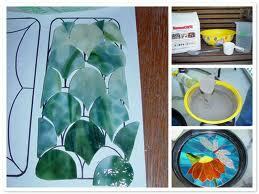 Making stepping stones is a relatively simple process if a few processes are followed. Pick a work area where the mold can be left undisturbed for 48 hrs. Prepare the area by putting a protective layer of newspaper or plastic around the work area. Place several pairs of gloves, bags of concrete, chicken wire, mould, stick back plastic, cut glass and water ready to hand. A mixing container is essential, and you should have the reinforcing chicken wire ready cut to size for the mould. A nearby dust bin is a good idea to be able to put waste into without moving wet materials far. Make sure the work area is level and the mould sitting on it is also level. Opalescent glass is the best to use for stepping stones, as it reflects the light. Transparent ones appear dark or black. The cut line cartoon should have lines at least 3mm wide – up to 6mm is also suitable. The cement needs to get between the glass pieces. Cut the glass to the edge of the cartoon lines. Ensure the glass pieces do not come closer than 12mm to the edge of the mould to allow the concrete to form an edge that will protect the glass pieces. Use clear sticky backed plastic and fix it – sticky face up – over your cartoon. Place the glass pieces firmly onto the sticky plastic. Cut the plastic to the size and shape of the mould to ensure no concrete gets under the glass. Put a separator on the mould – spray on oils can work, but Vaseline is a more certain separator. All of the mould surface must be thoroughly coated. Disposable plastic or latex gloves will help with greasing the mould. 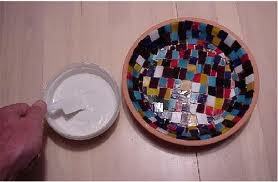 Carefully lift the sticky back plastic with the glass on it and place it in mold making sure placed in center. 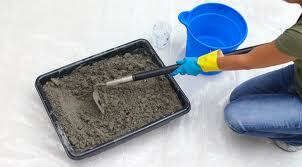 If you are making small quantities of cement, ready mixed concrete for general purposes will be suitable. 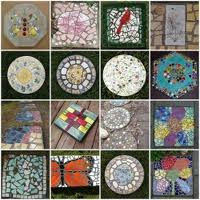 If you are making a number of stepping stones ,mix the concrete yourself as it will be cheaper. 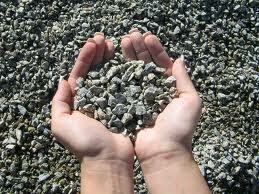 The ratios for general purpose concrete are 1: 2: 4 concrete: sand: stones. The water needed will be about 1.7 times the volume of the dry mix. Calculating the amounts: Square and rectangular moulds are easiest – multiply the length by the width to give the area and multiply that by the depth in centimeters. This will give you the volume in cubic centimeters. Divide the result by 1000 and you have the total number of litres required. For circular or hexagonal moulds multiply one half of the diameter (the radius) times itself and then times 3.14 to give the area. Finally multiply by the depth of the mould to get the volume. All of this is measured in centimeters. You have seven parts of dry material, so divide by seven and the one seventh will be the concrete needed, two sevenths the sand and four sevenths the volume of stones needed. The stones should not be larger than drive-way type gravel. 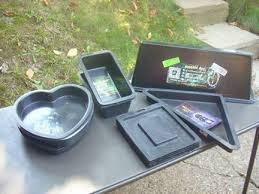 You can of course, just fill the moulds with water and measure the water required to give you the volumes you need. Mix up the dry materials, whether ready mixed or measured by yourself, to ensure everything is coated with the concrete. 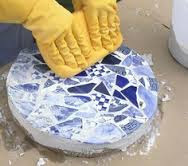 To get a fine, smooth surface to the top of the stepping stone, sieve out the stones from some of the mix to give you about 1 cm depth to pour between the glass pieces without any stones sitting there. 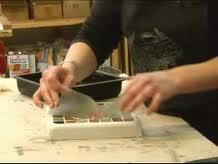 (Multiply area by 1 cm to give you the volume of dry material you need to put down the top layer.) When you have sieved that amount of material out, put the coarser material back into the dry materials and mix again. The stones are important to the strength of the whole stepping stone. Mix the cement, sand and small stones with about 1.5 times water until a thick pancake batter. Pour it slowly over the glass to ensure you do not disturb the placement of the glass pieces. When poured, tap the sides of the mould with a piece of timber to encourage air bubbles to rise. Mix the remaining dry materials with water and gently pour half of it into the mould. 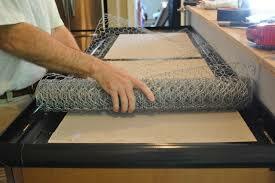 Then add the chicken wire for re-enforcement and fill with the remainder of the cement. The metal is better than the plastic version. Tap the sides of the mould again to drive air bubbles out of the mixture. There should be no pools of water on top of the cement, as too much water will weaken the concrete, as will too little. If there is excess it should be absorbed with some paper towels. This is the time to sign the stepping stone. There is a relatively short time after about an hour to do this while the concrete is stiff enough to hold the marks and not too stiff to resist any marks. Let the stone cure at least 48 hours before removing from mold. Do not move mold once the concrete is in it – you will get concrete between the contact paper and glass which causes the top to be uneven and more importantly can cause cracks in the concrete. When you are ready to de-mould, turn the mould face down onto a board. Ease the sides away from the concrete gently. It may drop out with just that encouragement. If not, press gently at the centre of the mould until it beings to release. Finally, if necessary tap the sides of the mould with a rubber mallet. Difficulty in removing the stepping stone usually relates to too little separator. Turn the stepping stone over with the assistance of the a board on the back. Look at the top of the stone and decide whether it is fully cured. If not, leave the sticky plastic on for a few more days before gently pealing it off. If you can see that there are gaps or depressions in the surface, you will need to take the plastic off immediately and make a small mix of concrete and sand (1:2) with water to fill those blemishes. Clean the concrete from the glass before fully cured as it is more difficult to get the dry concrete from the glass without scratching it. Let the stepping stone sit for 30 days before sealing. You can leave them flat or stand against a wall. In either case you should put some paper between so they don't get scratched. Clear concrete sealer, with two to four coats brushed on, will be sufficient for protection from moisture. Weather, temperature and time of year play a big part in the curing and de-molding. Do not put your mold in the sun to cure, as that dries out the water before the chemical reactions can occur. Concrete needs to cure slowly to achieve its maximum strength. For the same reason, you do not want to leave the curing concrete in freezing conditions as that will also stop the chemical reactions. If it is wet, you need to protect the curing cement from the rain as too much water can weaken the concrete too.